I had an abundant amount of apples this week and I picked up some beautiful strawberries to make this Slow Cooker Strawberry Applesauce. I love how well this recipe turned out. I wasn’t sure how the strawberries would stand out with all the apples, but they did perfectly. A perfect combination of flavors. My daughters number one request for me to make is applesauce and this new Slow Cooker Strawberry Applesauce is her new favorite. She loves it straight out of a bowl. And I love it on buttered buttermilk toast. This is one of those recipes that you can’t mess up. 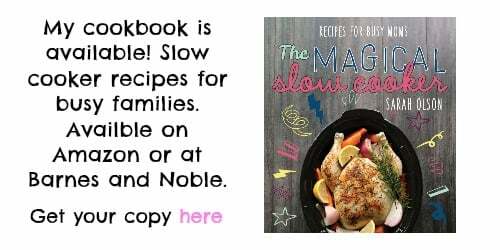 For my recipe I use what apples I have on hand, use as many apples and strawberries you have to fill the slow cooker 3/4 full. Also add the sugar to taste. I used sugar in the raw to sweeten this applesauce, I use that sugar for most of my cooking. You can see how easy this is to make below on my YouTube video, you can follow me here. 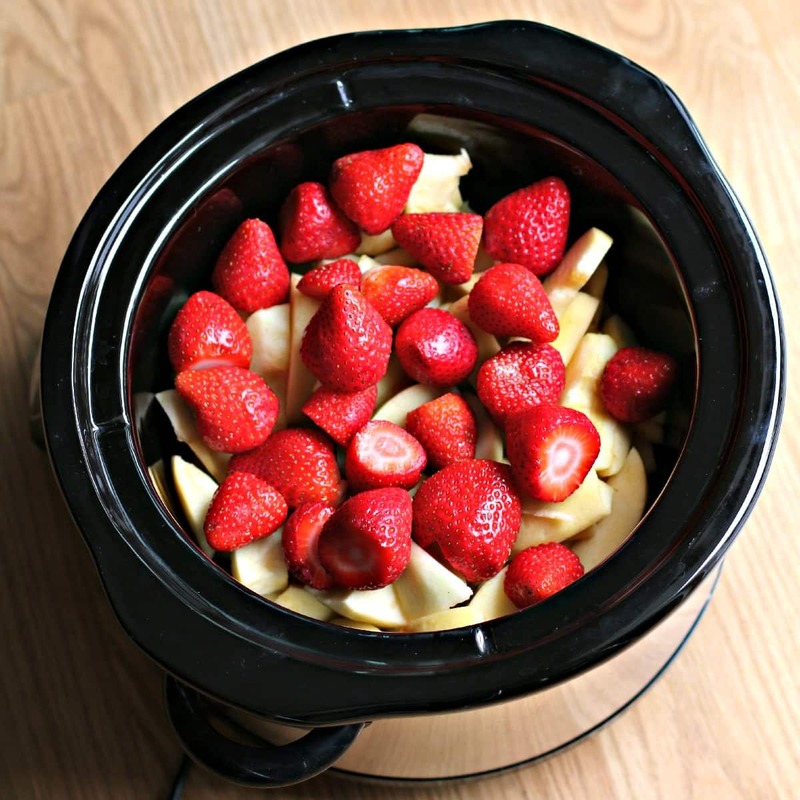 Add the apples and strawberries to a 5-quart or larger slow cooker. Add the water. Add cooked apples and strawberries to a blender, cover and pulse just a few times until smooth but not pulverized. Stir in the sugar to taste. This looks awesome! I haven’t made applesauce in the slow cooker, but I have made apple butter. I have some apples that I need to do something with so I think I’ll be stopping and grabbing up some strawberries on the way home from work today! 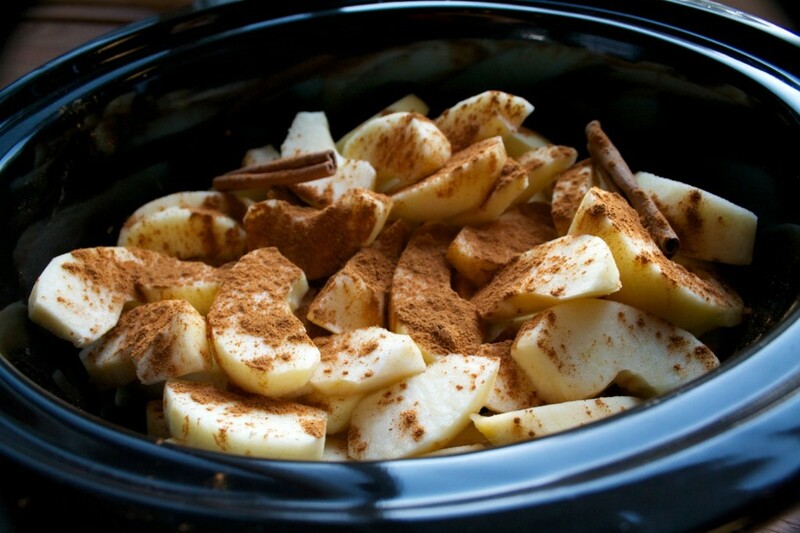 Good Morning, do you have a recipe for Apple Butter in the slow cooker? If you do could you send it to me. My Husband loves Apple Butter. Thanks so much. It sounds wonderful unfortunately the strawberries around here have been very expensive and completely lacking in any flavor! I’ll keep this recipe for next year, maybe things will improve! So fresh and delicious looking! 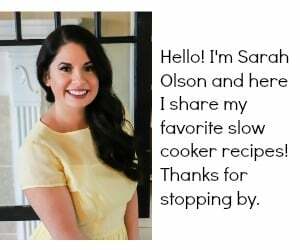 I love when the slow cooker does most of the work. Definitely want to give this a try! 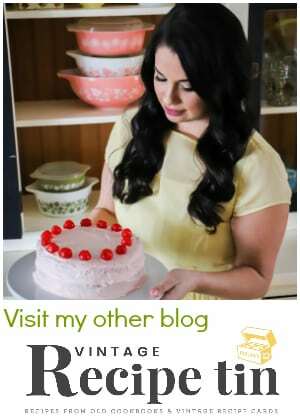 Strawberry season starts in November here in Florida and I cannot wait so I can try your recipe! Looks delish! 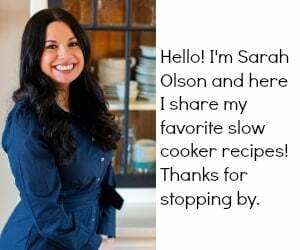 Such a fun and delicious recipe, Sarah!! I will have to try it! 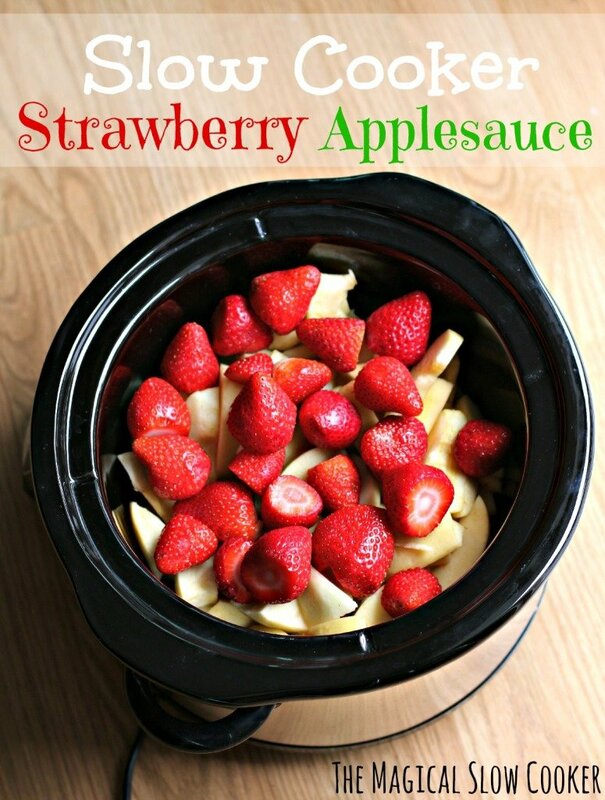 I make crockpot applesauce all the time, but never thought to add strawberries. I can just imagine how wonderful this tastes! Can’t wait to make up a big crock of it soon! Fantastic use of strawberries and apples; Genius! 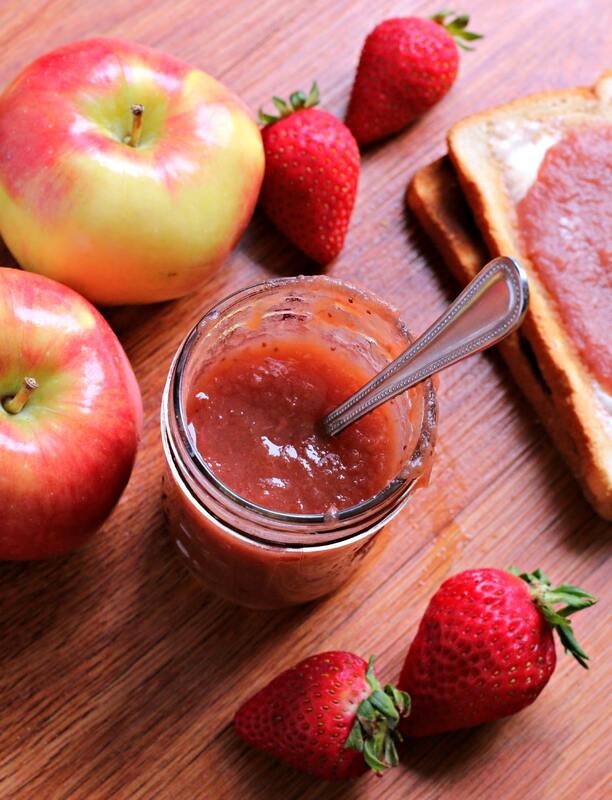 This applesauce looks amazing and I love the addition of strawberries! Perfect as a sweet treat or condiment! Really it’s this easy?! I have GOT to try this for my kids! I don’t know why I haven’t before, but this post is seriously making me want to THanks! I have fresh apples but I have frozen whole strawberries. Do you think frozen strawberries would work? I think they would do just fine! I love this idea of putting strawberries in applesauce. My question is … can this be canned and if so, any added ingredients?! I’m not a canning expert at all. Does anyone know if this recipe could be canned? I can cinnamon applesauce, so I would think you could can this the same way. I’m going to try it. Being diabetic, I have to watch my sugar intake. I’m thinking the brown sugar would be the best to add? Any thoughts out there about this? Thank you! How long do you think this would keep if canned?? I make my applesauce without adding any sugar and do not miss it…make it up with cinnamon and nutmeg…gonna try strawberries!! I live in the Mountains of Pennsylvania and as you can imagine, the winters can be quite isolating. So I decided to do some canning this past winter. I never made homemade jam or preserves let alone canned anything. Thanks to “The Pioneer Woman” I was able accomplish both. She gives detailed instructions with pictures which makes it very easy to follow. Anyway….my whole point to this comment was to say I never thought of making “Strawberry Applesause” until I was at the market yesterday buying more apples for my applesause. I saw these beautiful strawberries that were also on sale. I have plenty of strawberry preserves and I thought to myself, I know what I can do with these strawberries…add them to the applesause. So of course I had to go online for a recipe. I decided to use yours…so thank you for sharing, I’m sure it’ll come out just great! Can you pressure cook this? I don’t own a pressure cooker, I’m not sure what the liquid requirements or timing would be? I’ve done the apples with both strawberries and raspberries without adding any sugar and they both were good! I started a batch of this this morning. I’m going to can some and make some into fruit leather in my dehydrator! My blender broke and I haven’t had a reason to buy another one. Is there a different way to get this consistency? I often don’t use a blender. Cook a bit longer and use a whisk. Will turn out great.